For sportbike-loving riders who like to travel longer distances, sport touring motorcycles present a melting of performance and practicality. Borrowing aggressive, aerodynamic sportbike design features, sport touring motorcycles also include tall windscreens and storage compartments (regularly hard cases mounted to the rear side of the motorcycle). Similar to a sportbike, a forward-leaning riding position is often incorporated into the design of a sport touring motorcycle. Differing from conventional touring motorcycles featuring a heavier weight and a comfort-focused suspension setup, sport touring motorcycles are built to deliver a performance focused ride. Derived from the Ninja ZX-14 sportbike platform, the Kawasaki Concours 14 strongly conveys a sense of road-going performance but also includes additional comfort features such as an electrically-adjustable windshield. HID headlights, electrically-adjustable suspension and GPS systems are other high-end features typically found on sport touring motorcycles. 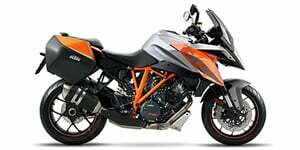 Engine displacement sizes for sport touring motorcycles generally range from 500 cc to 1,600 cc. Twin cylinder powerplants power most entry-level sport touring models while four cylinder powerplants are typically used in moderate to advanced models. 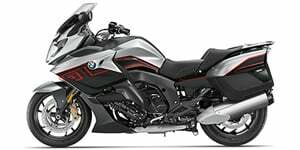 On the BMW K1600GT, one of the largest and most powerful sport touring motorcycles, a 1,649 cc engine is propelled by an inline-six powerplant.